A very interesting and educational post! Great for the free theme! 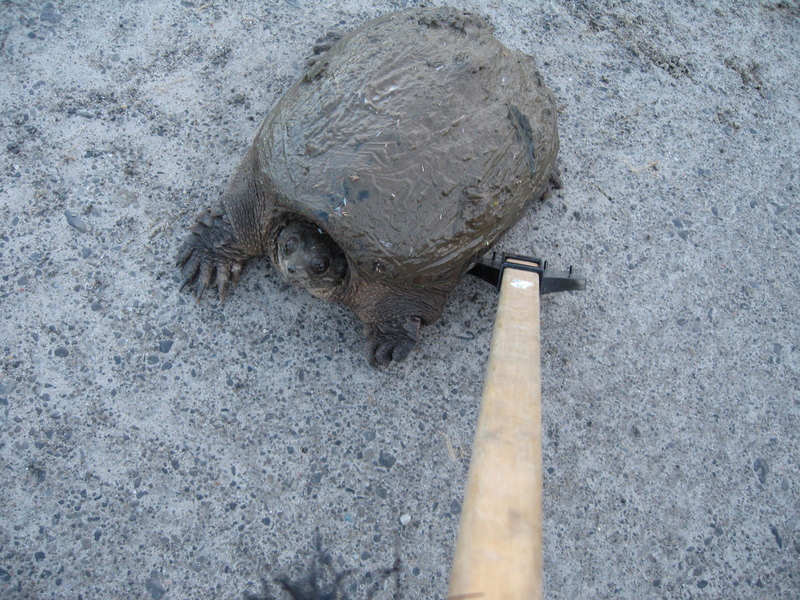 My daughter and I recently saw a young lady rescue a snapper that was crossing the road. My, did that critter SMELL!!! She actually put it in a container in her car and drove it over across the road to a small pond. It seemed happy for the ride and made its way to the pond!!! What a great idea for the theme. Thank you for such an informative post, I didn’t know any of that before. Your post has some great information. 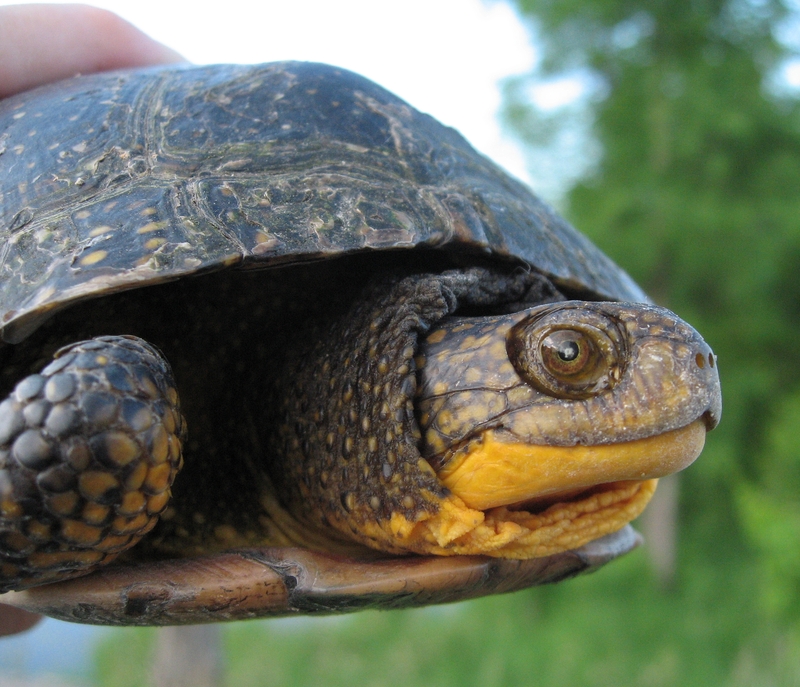 I’ve never come across a turtle crossing the road–but if I ever do I can use your helpful tips to get them to safety. When on back roads here in Oz you have to keep your eyes open not only for the large animals–emus and ‘roos–that will bound in front of you, but also for the slower stumpy lizards. i enjoyed your turtle post, turtles are very special here in hawaii too and they get very large since they are well protected. a great post for FREE. I think those turtles are cute. 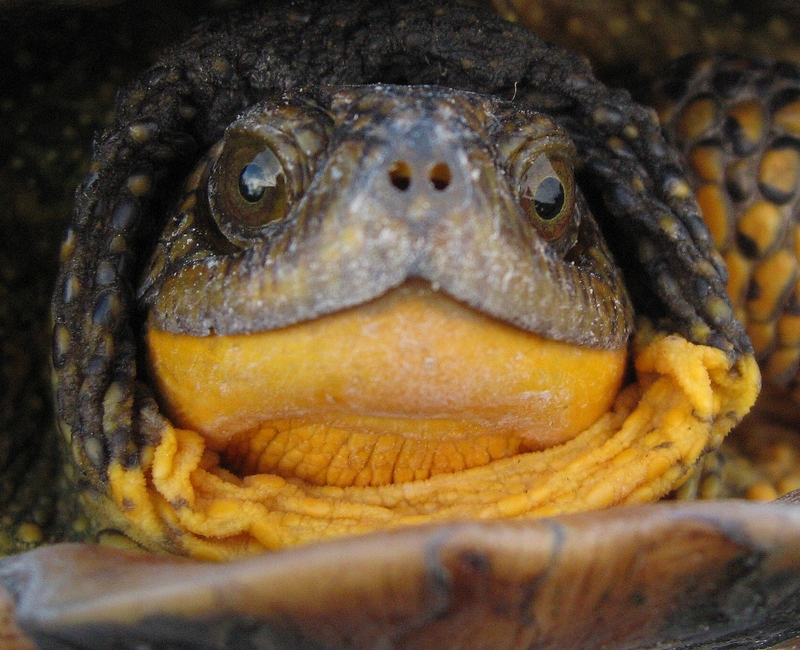 The Blanding’s Turtle was certainly a handsome fellow (it was male) and he had beautiful eyes! His yellow neck was such a beautiful colour and seemed so soft (I didn’t try and touch it). I wouldn’t call the Snapper “cute” but he (or she) sure had personality! What a great use of this meme to make a point! We love turtles and hope your message reaches many. Thanks! People rarely notice turtles on the roads and I am always appalled when I see several (even one is too many) run over at the same spot. I ALWAYS watch the road when I am near swamps or near waterways. There are going to be times when an animal darts or bird flits out in front of your car (I cannot TELL you how many chipmunks have committed suicide by dashing in front of my car!) but if you can prevent a single animal from being killed, it makes life worthwhile. I stop for turtle’s too but they are always small box turtles here in NC. Yours are much larger! Wonderful pics. I WISH I had thought to get a photo of the really large Snapper I rescued a few years ago (with my elderly mother and her almost as elderly friend!). It was HUGE and lunged and hissed! I HAD my calera, too. I just plain forgot until I got home. toads pee too. . . It is amazing how many people there are that stop and move turtles across the road. I do too, so I’m glad to meet another one. I don’t usually take portraits of them, though. 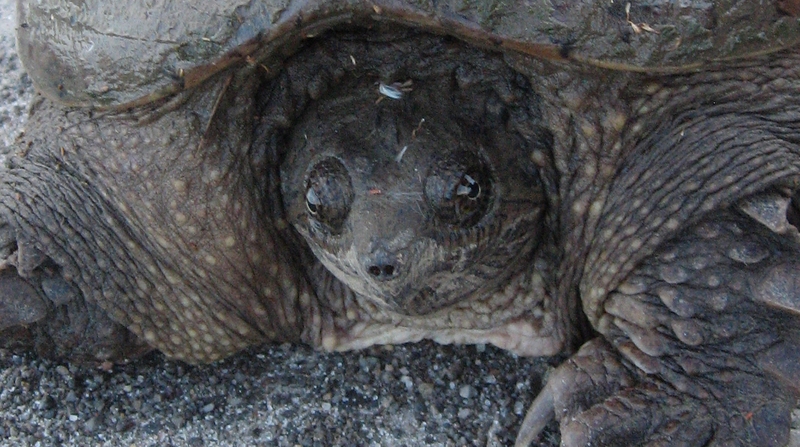 Even snapping turtles have their own vicious charm and beauty. Truly amazing to think how ancient their blood line is. Freed from a squishy fate – well done! 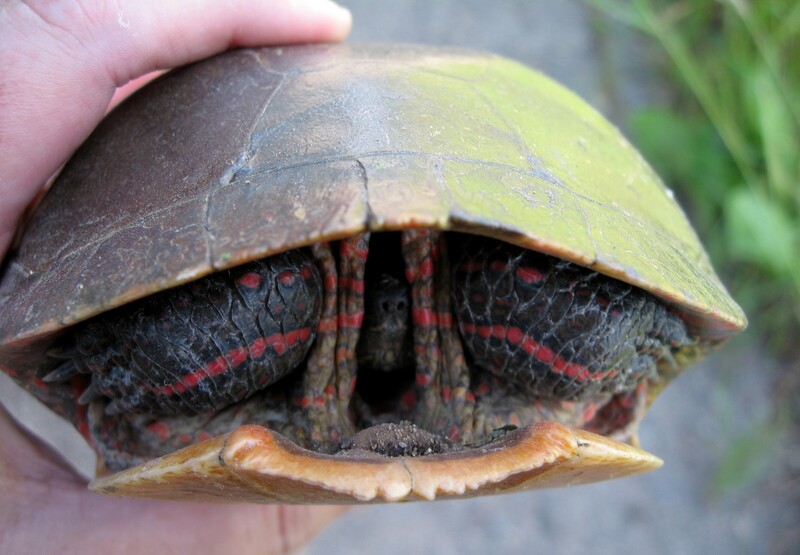 The painted turtle is very unique. Lucky turtles, they crossed your way! What a handsome fellow! Far better to be taken to a river than stay where it waas. Getting peed n is a small price to pay for a good deed! Well, I think that the turtle was only doing what turtles do to protect themselves when large biped captures them when they are minding their own business. And rescuing the turtles sort of made up for having clocked a Mourning Dove the week before, poor thing. good on you to have freed them from near death!